Who Does The Bible Say Will End Up In Hell? 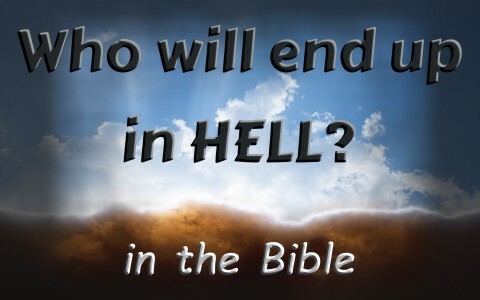 Does the Bible reveal who will end up in hell? Is there no escape afterwards? When Jesus comes to judge the world in righteousness and separate the sheep from the goats, He will say to some, “Depart from me, you cursed, into the eternal fire prepared for the devil and his angels” (Matt 25:41) so the belief is that hell was prepared or made for the devil and his angels (demons) but is that what this verse really says? The eternal fire was prepared and was ready for the devil and his demons to be cast into it someday (Rev 20:10) but it was prepared long ago, perhaps even back in the Garden, when the serpents head was prophesied to be crushed someday (Gen 3:15). The Apostle Peter wrote, “if God did not spare angels when they sinned, but cast them into hell and committed them to chain of gloomy darkness to be kept until the judgment” (2 Pet 2:4), it appears some demons may already be in hell. Were these angels or demons so wicked that they couldn’t even be allowed freedom? We don’t know for sure because there are sparse supportive Scriptures about this verse. I believe it is a waste of time to debate over whether hell was made for Satan and his demons or not. The important thing is not if it was made for Satan and his demons, but who ends up going there. One of the arguments I’ve heard against believing in God is that God sends people to hell. No, He doesn’t. They send themselves there by rejecting their only means by which they can be saved and that is Jesus Christ and Him alone (Acts 4:12). Then there are those who say, “I won’t choose” but by their indecision, they’ve made a decision and that’s a decision not to trust in Christ. Jesus said “Whoever is not with me is against me, and whoever does not gather with me scatters” (Luke 11:23). There is no fence sitting because the fence and all on the other side of the cross will be cast into the fire. Today is the day of your salvation (2 Cor 6:2) if you’ve never repented and trusted in Christ. Every one of us are one blink of an eye from eternity and immediately after death, we’re judged (Heb 9:27). The author of Hebrews warns everyone who has yet to believe that “Christ was sacrificed once to take away the sins of many; and he will appear a second time, not to bear sin, but to bring salvation to those who are waiting for him” (Heb 9:28) and all who have rejected Jesus will weep and wail on account of seeing Him (Rev 1:7). Being human is 100% fatal, in time. The statistics on death are very impressive; 10 out of every 10 die. Hell was often described by Jesus as a place of wailing and gnashing of teeth (Matt 25:30) which seems to describe intense regret that causes grievous cries of agony but that same place was described as utter darkness (Matt 25:30). The torment there never stops (Rev 20:10) but the suffering seems to be dependent upon who was more evil and who was less so. Jesus said in Luke 12:46 that “the master of that servant will come on a day when he does not expect him and at an hour he does not know, and will cut him in pieces and put him with the unfaithful” but “that servant who knew his master’s but did not get ready or act according to his will, will receive a severe beating. But the one who did not know, and did what deserved a beating, will receive a light beating. Everyone to whom much was given, of him much will be required, and from him to whom they entrusted much, they will demand the more” (Luke 12:47-48). This means that everyone will be held accountable for what they did or they didn’t do in their lives (Matt 25:45-46) but also “on the day of judgment people will give account for every careless word they speak” (Matt 12:36). The point is, we’re all in big trouble because our sins have separated us from God (Isaiah 59:2) so who goes to hell and how do we keep from going there? Paul gives us a great description of exactly who is going to hell but he does so as a warning to those in the church at Rome, perhaps knowing that there are always tares mixed in with the wheat (Matt 13:24-30, 36-43). He writes “those who practice such things” (Rom 2:2) and knowing God “who judge those who practice such things and yet do them yourself—that you will escape the judgment of God” (Rom 2:3), Paul warns their “hard and impenitent heart you are storing up wrath for yourself on the day of wrath when God’s righteous judgment will be revealed” (Rom 2:5). Thankfully, “God has not destined us for wrath, but to obtain salvation through our Lord Jesus Christ” (1 Thess 5:9). If you have repented of your sins and placed your trust in Jesus Christ, then you are saved. Everyone who rejects Jesus Christ has the wrath of God abiding squarely on them (John 3:36b). That’s a horrible place to die. Who goes to hell? It is everyone who rejects the only way to eternal life (John 3:16) and that is through Jesus Christ (Acts 4:12) and Him alone (John 6:44). Do that and heaven’s yours; reject that and you choose hell. Have you received the free gift of eternal life? It is offered to all who come to Him and humbly repent of their sins, confess them to God, and place their faith in Christ. The Bible says “if you confess with your mouth that Jesus is Lord and believe in your heart that God raised him from the dead, you will be saved” (Rom 10:9) for it is “with the heart one believes and is justified, and with the mouth one confesses and is saved. For the Scripture says, “Everyone who believes in him will not be put to shame” (Rom 10:10-11) so it is true that “everyone who calls on the name of the Lord will be saved” (Rom 10:12). Is that you? I pray right now, even as I write this, that whoever will read this will be or has been saved. That means you’re not headed for hell but for the kingdom of God and the King of that kingdom, Jesus Christ. Learn more about hell here: Is There Really a Placed Called Hell? I hope all is well and God bless you for such wonderful articles. I feel that I am not fit for heaven even though I have confessed and asked for forgiveness and have repented and successfully turned from my sinful ways. I feel that He is leaving me in certain situations to test me. Recently I quit my job due to bullying, I asked for Him to intervene to no avail and I have been living beside of rude, disrespectful neighbors for about four years now. It’s a daily war between the two of us. I know I am called to love and to stop fighting evil with evil but I am receiving no assistance supernaturally. I haven’t rejected eternal life but I feel that my refusal to show my neighbors respect will keep me from heaven. I don’t even know if I am saved anymore since I fail at even the smallest tests. Any advice would be appreciated. Hello Amy. I am so sorry for all the great troubles you’ve seen and how you feel right now. Why not call your pastor and tell him just what you told me as we need one another and more so as the day approaches (Heb 10:24-25). If you don’t know you are not saved, you might not be. You must find this out today, as if Christ returns, it’s too late. Can you tell me how you were saved? When did that happen? A person is not kept from heaven by not helping their neighbors. It is repenting of your sins and trusting in Christ. God brings us to repentance and then we place our trust in Christ and then, God places you into the body of Christ, the church, where it pleases Him, so please call your pastor and tell him and ask your church to pray for you as we are commanded to do (James 5:14) as we need one another and seek to do what Jesus commands us to do (Matt 25:34-39) as we do it to Him (Matt 25:40) or we do nothing for Him (Matt 25:41- and that’s not good (Matt 7:21-23). Wonderful story. God bless you.